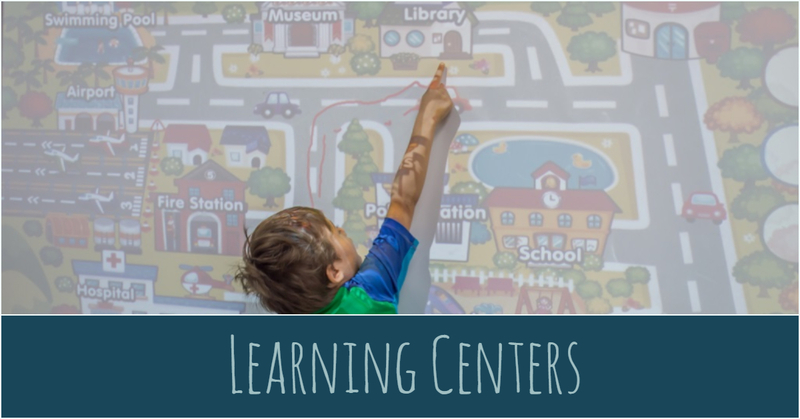 Learning Centers are areas set up within the classroom with a specific focus that encourages children through play to learn and practice different skills. In the Block Area, children use their fine motor skills, test physics concepts through balance, size and form, use their imagination and spatial knowledge to decide and test what to build and they also classify by shape, size, and color. All of this uses problem-solving skills. In the House-Dramatic Play Center, children act out realistic everyday life situations as well as made-up fantasies, they verbalize ideas, cooperate with their classmates, use their fine and gross motor skills to practice independent self-help skills (like dressing up on their own) and observe their peers to understand emotions. In the Manipulatives Center (writing, puzzles, playdough), children will use and test their fine motor skills in a variety of ways, advance their hand-eye coordination, focus on spatial concepts and enhance cognitive development. All of these skills are fundamental to prewriting. In the Art Center, children have a choice of different ways and materials to express their artistic ideas. They use their fine motor skills and hand-eye coordination, their imagination and transform their ideas into drawings and representations. In the Water-Sand Table Center, students experiment and test physics and physical science while developing fine motor skills and being exposed to different sensory materials that promote the use of all their senses. They have to use problem-solving skills and they explore the qualities and characteristics of liquids and solids. In the Science Center, children learn new concepts and vocabulary, they test, plan, observe, predict and compare ideas and they will draw conclusions about their findings. It helps them discover and learn how things work. In the Reading Center, students have a class library with a variety of books to sit down comfortably and quietly to read alone, in groups or with the teacher. Here they learn to take care of books, how to use them correctly, they model the reading behavior they see their teacher use and they connect stories to pictures.